Ok…you’re nervous! It’s the day of the interview with that position you’ve been longing for and you’re supposed to feel this way. Look around, what’s the one thing you notice in the lobby? That’s right. Guys with no sense to stand out amongst the crowd. The guy in front of you has on a shirt that is barely pressed and untucked, while sporting it with a very dated tie. Sure, there’s a couple of guys with suits on, but they’re ill-fitting and black. Black suits are worn solely for funerals, so do you really want your career to be synonymous with death? After a brief deliberation our team has concluded that the first step to putting your best foot forward in any interview is to dress the part. 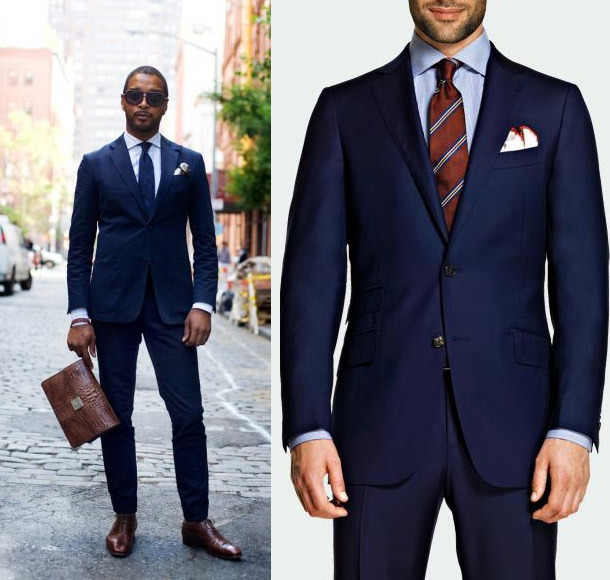 The only way to do so is to find a blue suit, but before we start a wild-goose chase, set up an appointment for a consult with one of our experienced image consultants. This is how good you could look, before and possibly after you land your new job.